omid (mashhad, Iran) on 22 January 2018 in Animal & Insect and Portfolio. Magnifique, on dirait de l'or. 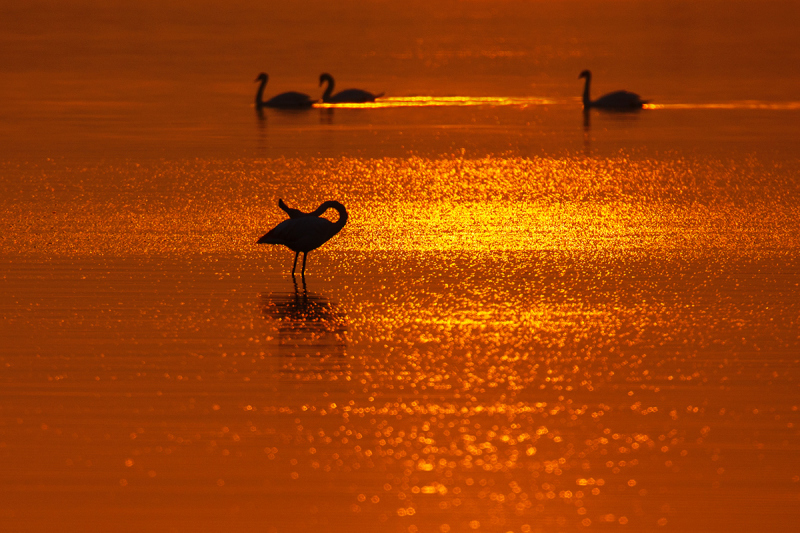 Superb silhouettes and golden light ! Wonderful golden red light color and superb composition . Superbe cette photo !! bravo à toi ! The colour saturation is outstanding! Nice shot! Another of your perfect moments . .
Frame it and put it on a wall ! Exquisite light, texture, composition, and colour. A fine, colorful capture of these birds. A winner for sure. Fantastique couleur et oiseaux quelle image splendide. Elegant birds and lovely light. Fantastic silhouettes in golden light. Another of your marvellous 'golden' images, Omid! Taken just one click before the one you posted on 28 September 2017, right? My goodness what a beauty ! Outstanding work on this, my friend :) Bravo ! I like the title of the gorgeous image.